Geobacillus stearothermophilus spore strips are sealed in a glass ampoule with growth medium and bromocresol purple pH indicator. 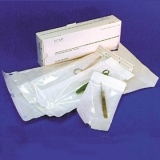 During the sterilisation process, the sterilant enters the vial via holes in the cap, and the label will change from rose to brown indicating exposure to sterilisation conditions. After sterilisation step the vial is ‘crushed’ so that the growth media and spore strip are mixed and incubated as per instructions. 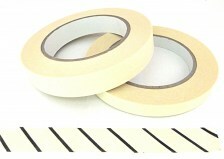 After the incubation period any surviving spores will grow and cause a yellow colour to develop, indicating a load ‘failure’. 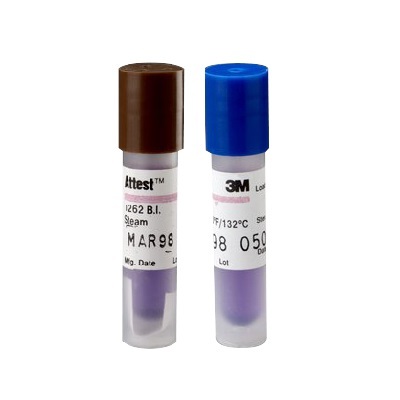 3M™ 1261 with blue caps is used for steam 132°C gravity displacement sterilisation cycles. Vials are incubated at 56°C for 24 hours. 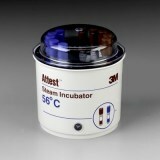 3M™ 1262 with brown cap is used for steam 132°C vacuum assisted or 121°C gravity displacement sterilisation cycles. Vials are incubated at 56°C for 48 hours.